America is a strange place. After driving your 100th or 400th mile, you tend to go a little crazy. 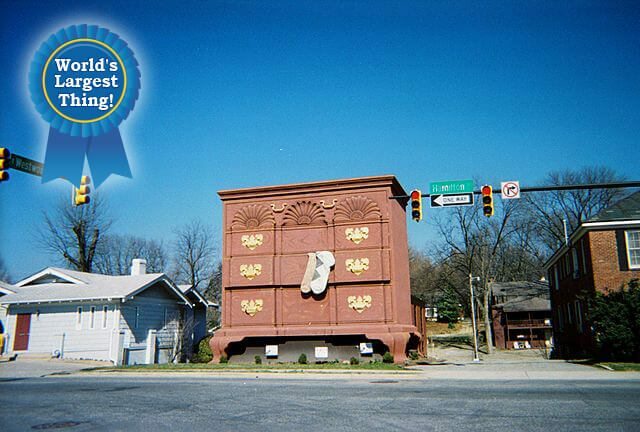 We’ve broken the monotony of more than 4 million miles of plain road with some truly weird roadside attractions. 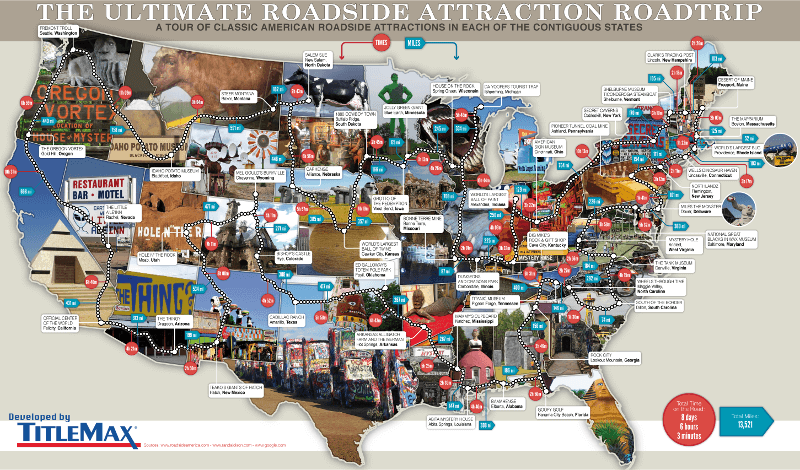 Map out the perfect road trip using this huge list of the most absurd, zany, and downright fascinating American roadside attractions. 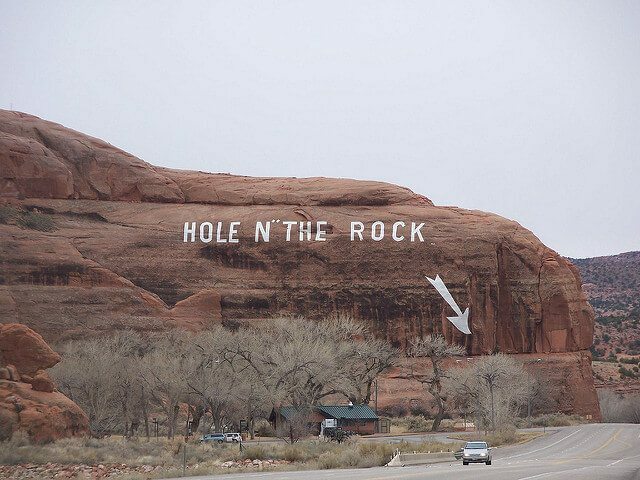 In the US, we have some hick masterpieces, some amazing natural wonders, some of the weirdest “world’s largest” versions of common things, and so many unusual roadside attractions that are so incredibly lame that they circle back to being cool again. 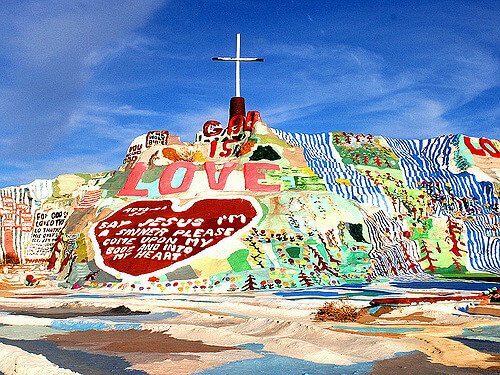 Create your very own cross-country ultimate American road trip map with our list of 79 absurd roadside attractions from across the USA! You know how Americans tend to believe that weird creatures like Bigfoot really exist? 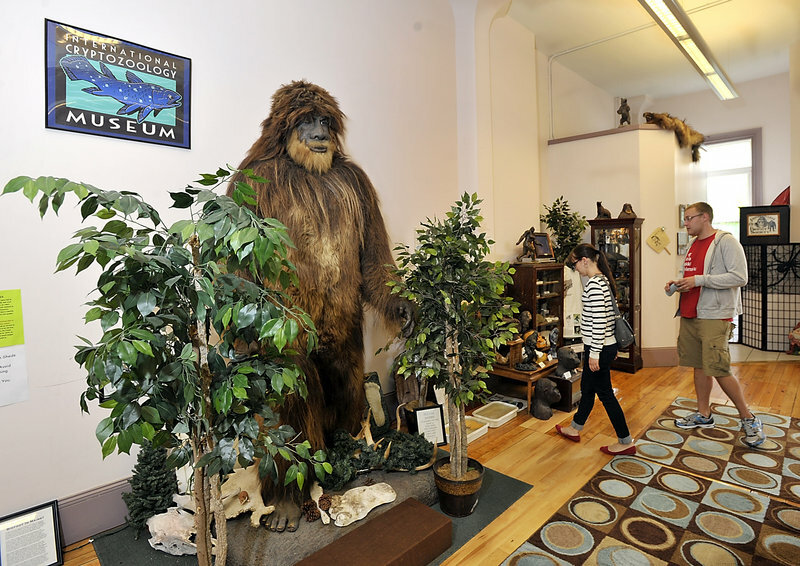 This is a real, serious museum exploring these rumored beasts. 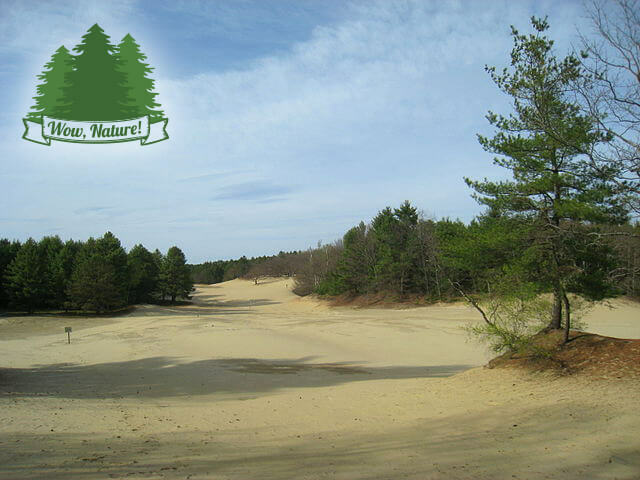 See a sandy desert in the middle of pine trees, like a reverse oasis. While the plastic camel can be a bit cheesy, this obviously failed farm turned tourist attraction exposes glacial silt and is preserved as a natural wonder. 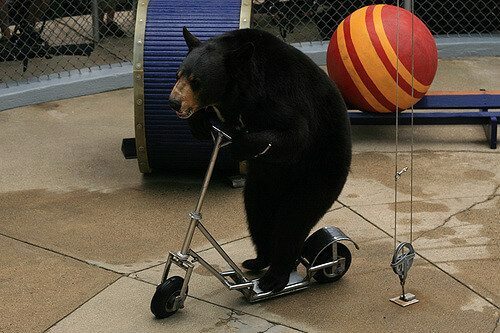 Famous for its trained bear show, this attraction tucked away in the White Mountains contains a history museum and a steam-powered railroad. Honoring their dearly “de-pinted” ice cream flavors, the Ben & Jerry’s factory also offers the “Vermonster,” which is a giant sundae you can share with your kids. 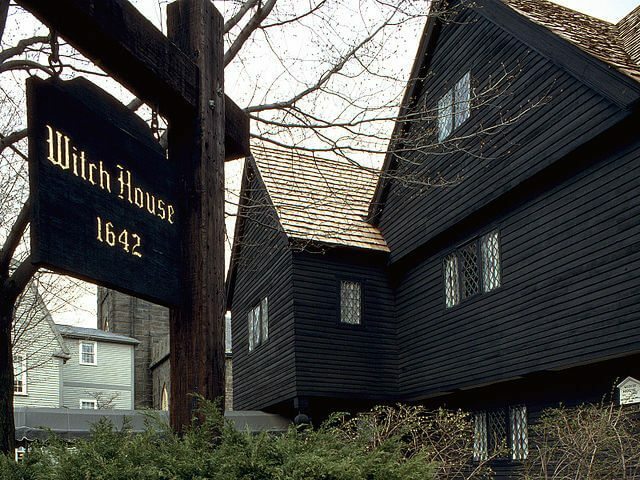 A historic building tied to the witch trials of 1692, the home of Jonathan Corwin is one of the favorite stops in the whole state for the month of October. 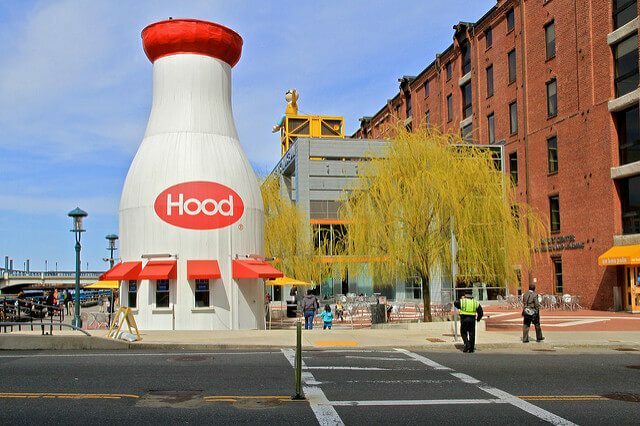 Boston locals are weirdly enthusiastic about this landmark, which serves as a 40-foot-tall concession stand next to the Children’s Museum. Even though it might not be the world’s largest, it seems to be the most loved bottle of milk structure. Check out the mini Jurassic Park in Connecticut of rocking dinosaurs, built by Jeff Wells out of fiberglass. 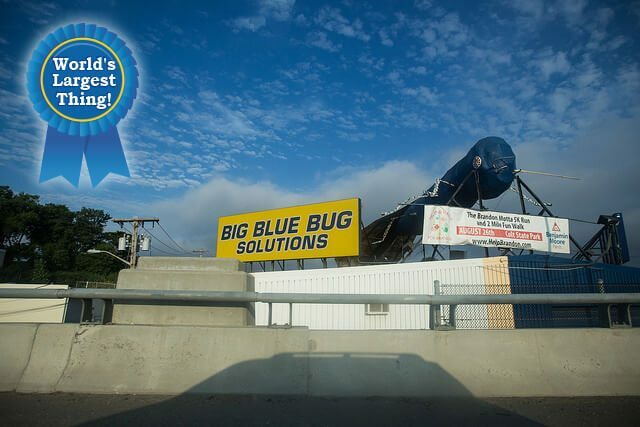 The Big Blue Bug, also known as Nibbles Woodaway, is a giant termite just chilling along I-95, advertizing for his pest control company. He’s 928 times the size of a real termite and supposedly the world’s largest artificial bug. Locals love Nibbles, frequently decorating him with hats, Christmas lights, and sunglasses. New York’s Schoharie County is, as it turns out, full of holes. 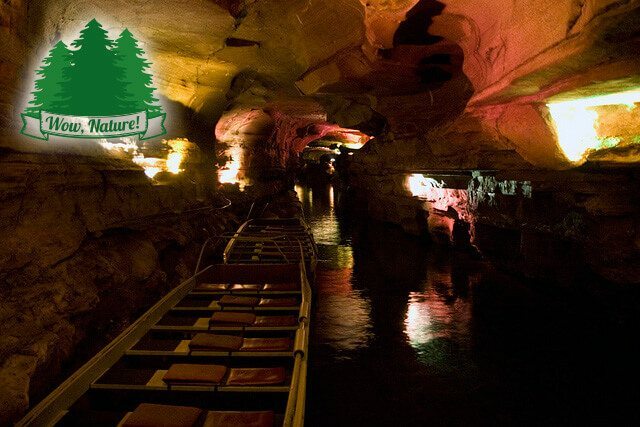 Howe Caverns and its less-popular, more offbeat, colorful neighbor and competitor, Secret Caverns, have been wowing visitors for years. Just watch for some incredibly artistic, hand-painted signs that point the way! Fans of the jiggly, wiggly, essentially American dessert can be wowed by the outlandish flavors, interesting molds, fun recipes, and fascinating history that have come from more than a century of feeding fun. 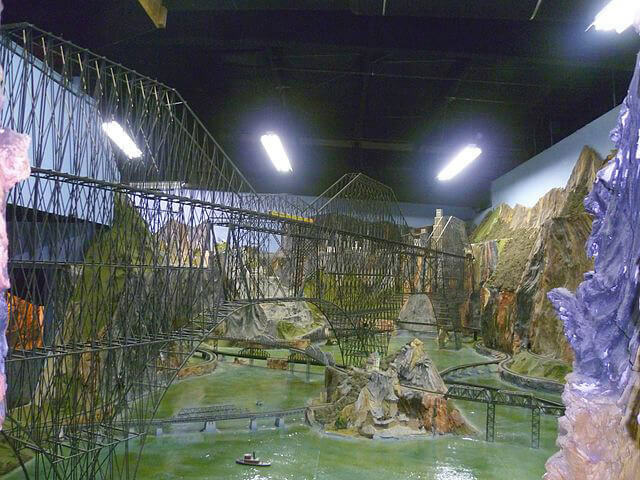 A model-train fan would go nuts at this German-styled miniature countryside, complete with bridges over canyons, thousands of buildings in mini cities (one section even has eight-foot skyscrapers), and more than eight miles of track. Also, there’s a huge doll collection. 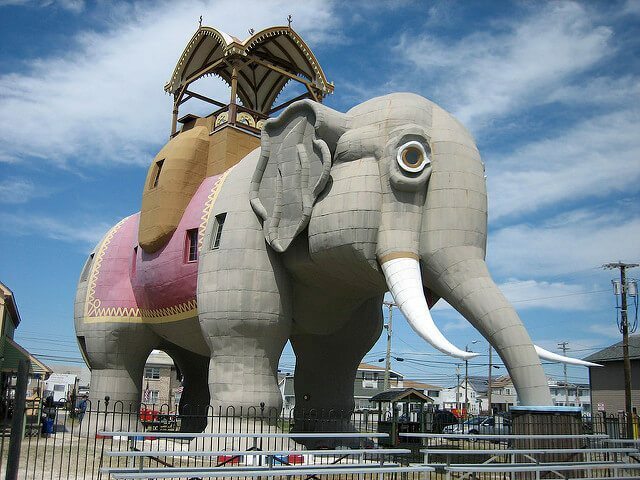 A national historic landmark and the “World’s Greatest Elephant,” this hotel-turned-tourist-attraction is a local favorite. 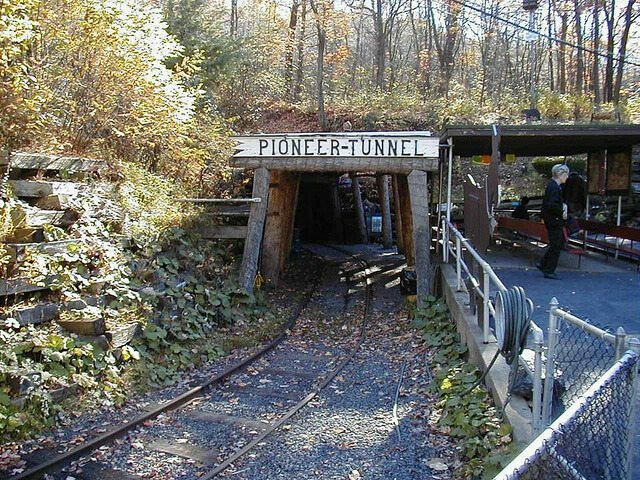 Go underground into an actual anthracite coal mine! This spot has everything from a steam locomotive to a ride that goes straight into the side of a mountain. If this actually works, we’re prepared to live the life from Tuck Everlasting. 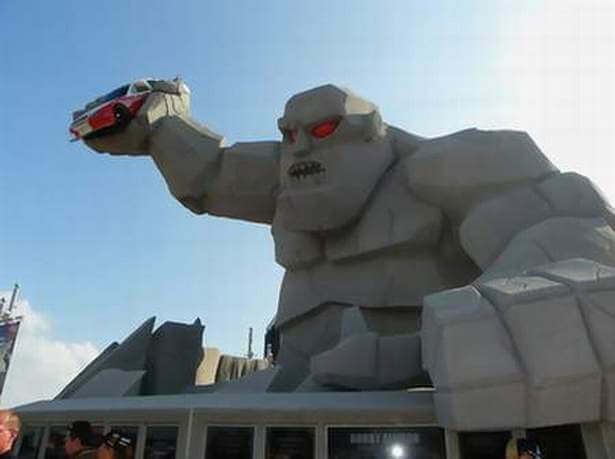 You might actually be on your way to see a race at Dover International Speedway, but why not wave to the monster while you’re there? Madame Tussauds is a bit too white, wouldn’t you say? 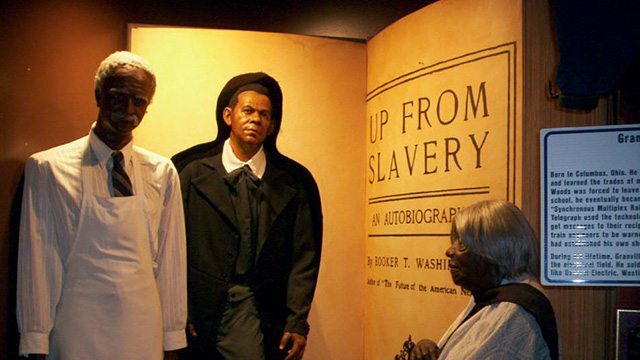 This attraction for history buffs features more than a hundred influential African Americans. 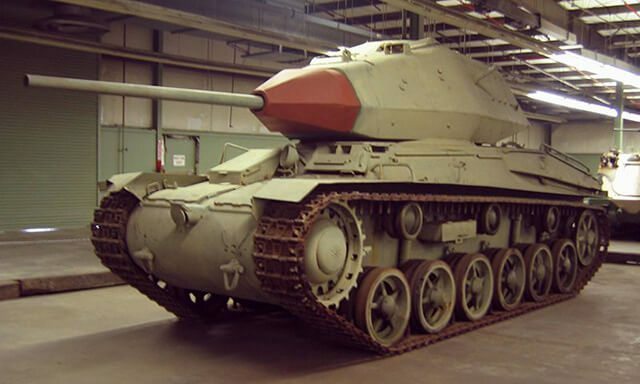 A former millionaire collected tanks from all over the world as well as helmets and other military items and reproductions. 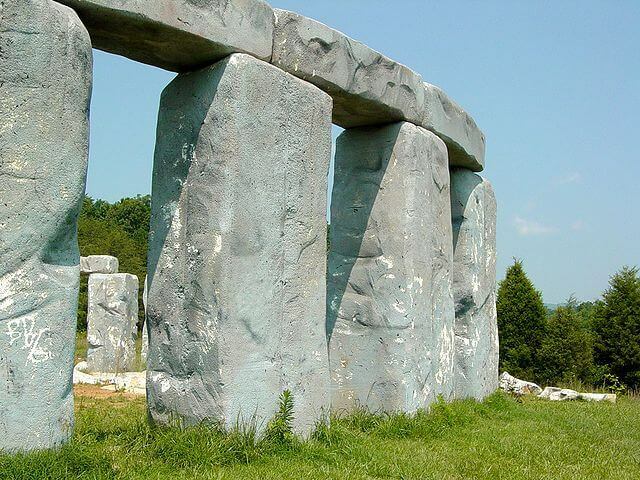 Do we need so many Stonehenge replicas in America? Yes. This fiberglass and foam art replica was made by Enchanted Castle Studio. 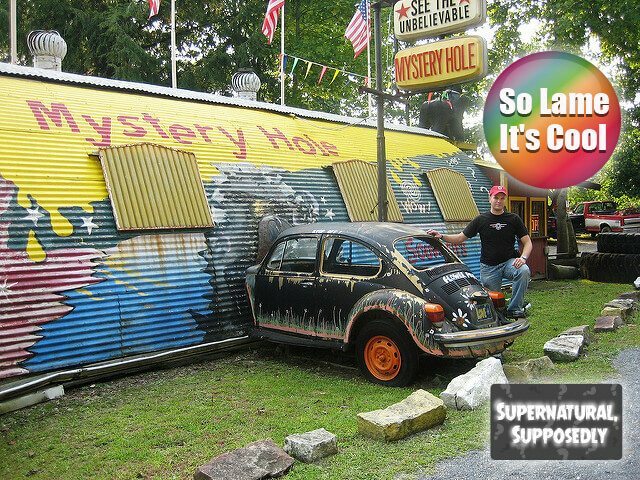 The magical mystery hole dazzles visitors because of its gravity, or lack thereof. The series of optical and physical illusions combines wacky folk art and hippie charm and has created an enthusiastic group of avid fans. 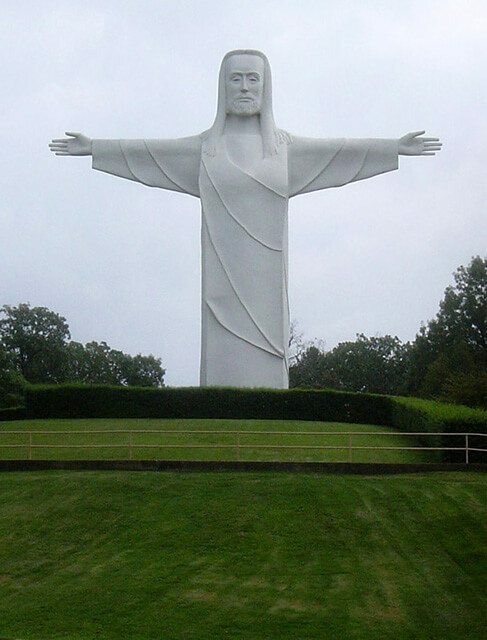 Built during the Great Depression, this state of Jesus may seem like a small, milk-carton-like imitation of the world-famous Christ the Redeemer of Brazil, but it still brings in a crowd. 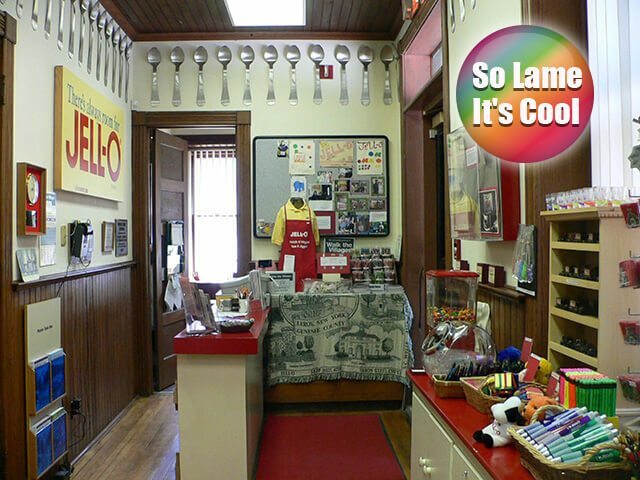 This controversial yet locally loved miniature restaurant and gift shop was once made to imitate the black character from Gone With the Wind but was painted a lighter shade in the 1960s. Also home to random dinosaurs wandering the wood, Elberta houses its own Americanized recreation of Stonehenge out of fiberglass. 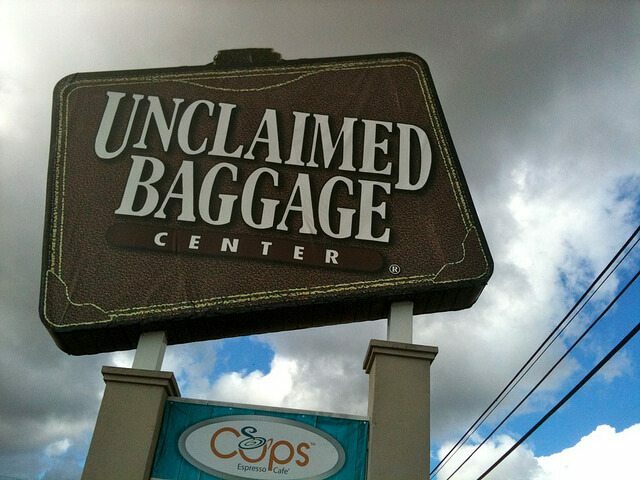 With more than a million visitors every year, this treasure trove contains items that have been packed away in a suitcase and never claimed at the airport. Outside of a huge Hooters and overlooking the beach, this massive wing weighs in at 1,037 pounds. As this huge art project was carved out of coral by a single man, no one knows how Ed Leedskalnin made this piece. 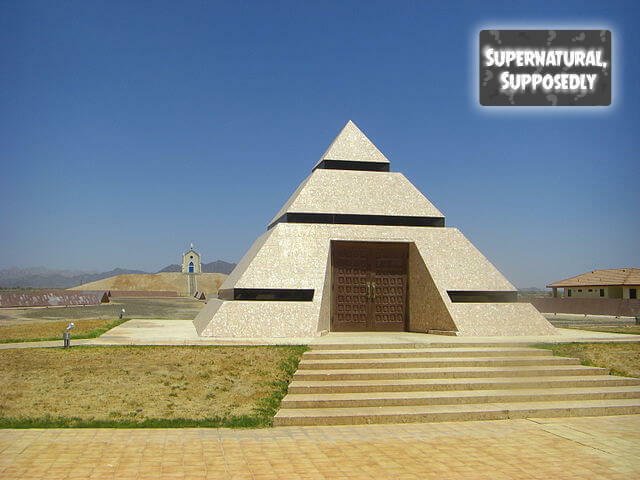 Supposedly, no one ever saw him work on it, and he used “the secrets of the pyramids” to build it. It’s beautiful either way. 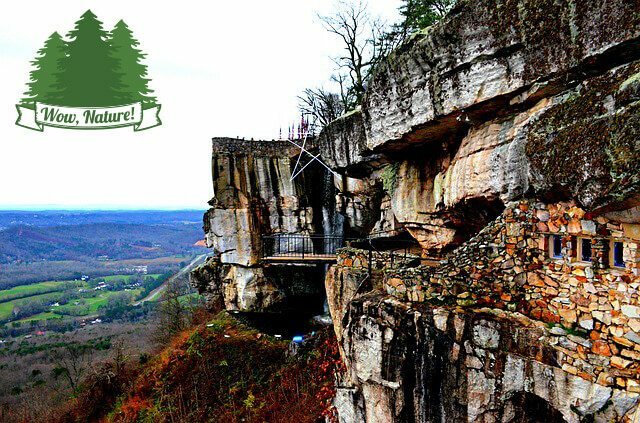 You can view seven states at once from Lover’s Leap at this Lookout Mountain site. 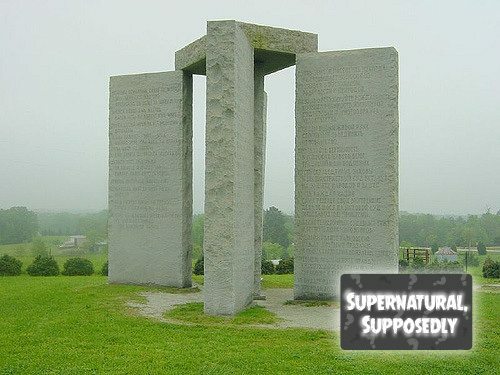 Sometimes called “the American Stonehenge” (and not to be confused with the other henges in this list), the granite monument is inscribed with a set of guidelines in eight languages. The guidelines are general recommendations for ruling humanity in a post-apocalypse wasteland. 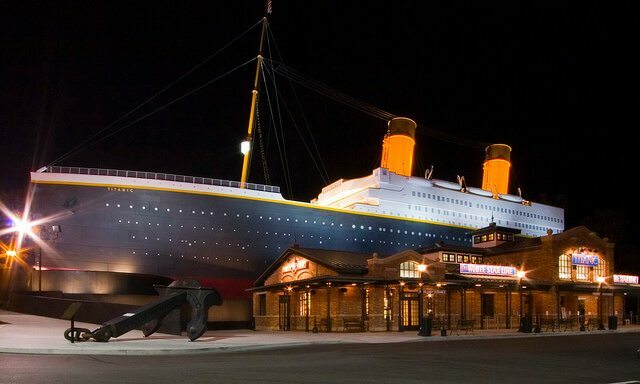 Have you ever wanted a ticket to board a ship fated to sink? Well, your dream has come true! 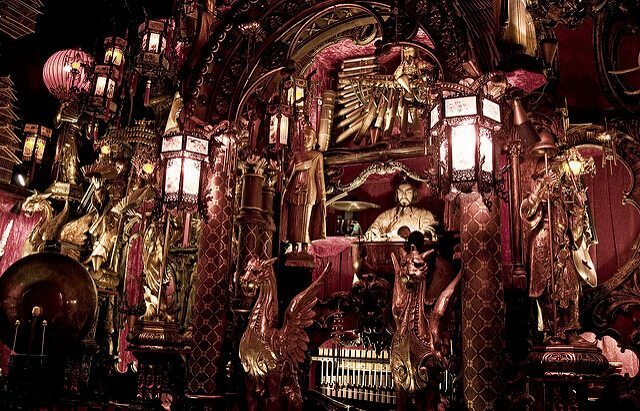 Featuring rare items pulled from the vessel and complete re-creations of rooms in the ship, this relatively new attraction has been drawing history and film buffs from all over the country. This might seem pretty lame, but once you’re near the oversized chest of drawers, you’ll also happen to be in one of the best places in the world for buying furniture. 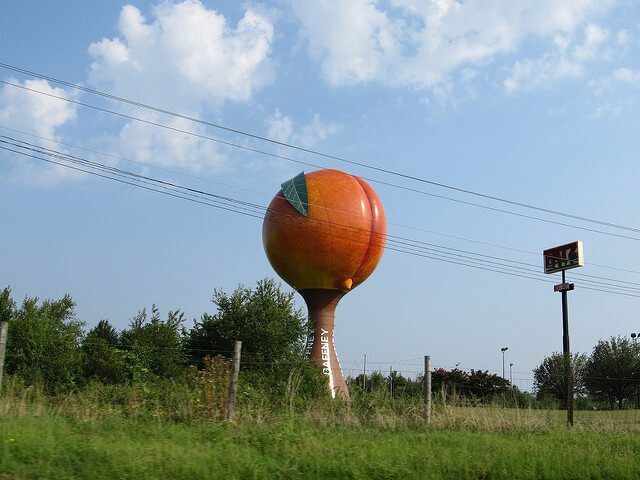 A strangely much-loved water tower made in the shape of a giant peach, this iconic landmark is near the border between North Carolina and South Carolina and has spawned decades of dad jokes about buttocks. Built in Jody Pendarvis’s backyard, this flying saucer is meant for locals on Earth to welcome our extraterrestrial friends. Pendarvis claims to be able to talk to them. 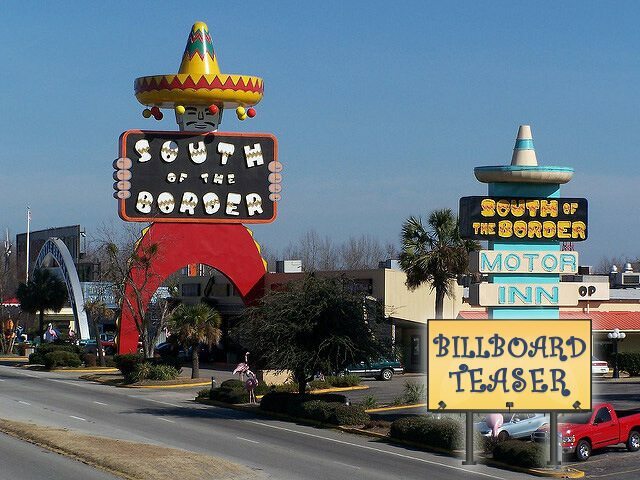 With 120 very pun-based billboards, this gimmicky favorite is most often visited by road-tripping northerners. But the food is pretty good! 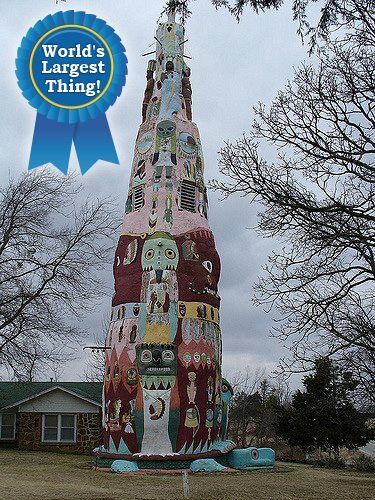 Home of the world’s largest totem pole, this park has been famous since the heyday of Route 66. 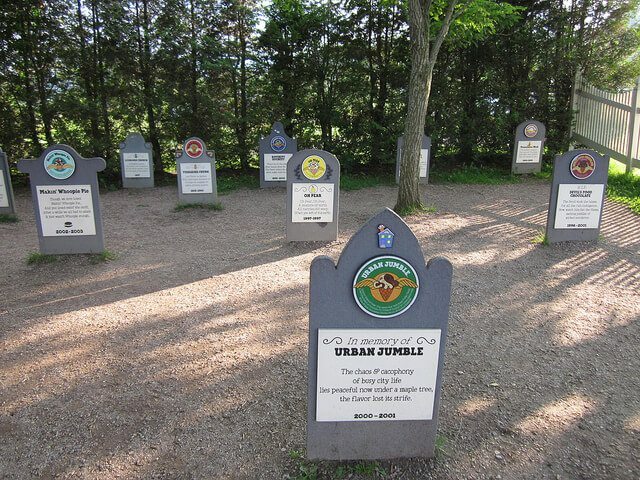 Now, it’s an honored outdoor museum. 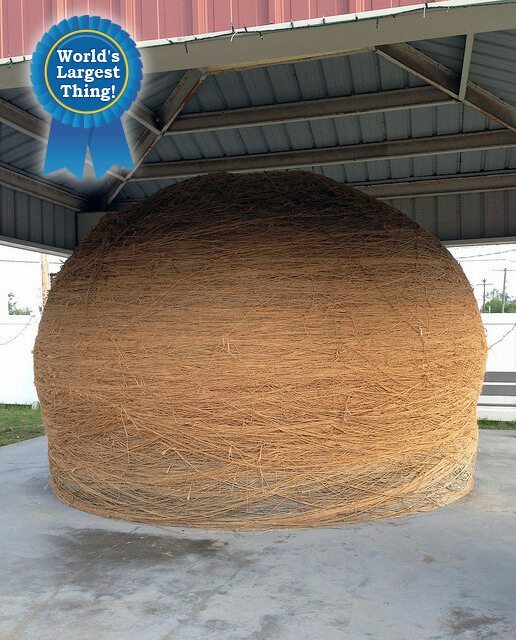 It’s sad and strange that America would have an intense battle for which is the actual largest ball of twine. But Kansas’s mammoth ball seems to be the biggest. 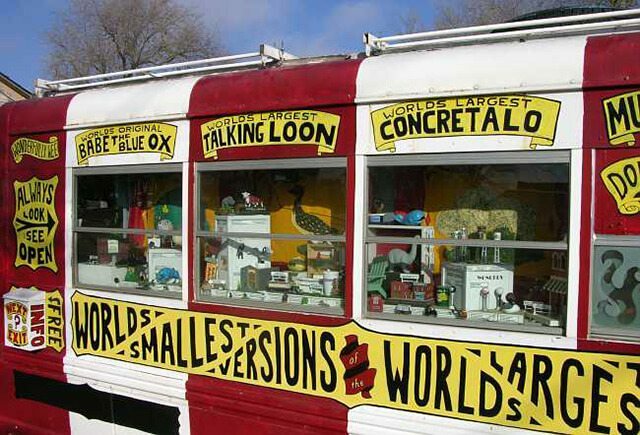 (Talk about your convoluted concepts … ) This mobile museum is a collection of the tiniest versions of the “world’s largest” versions of things, like the world’s largest ball of twine, made to be about the size of your thumb. 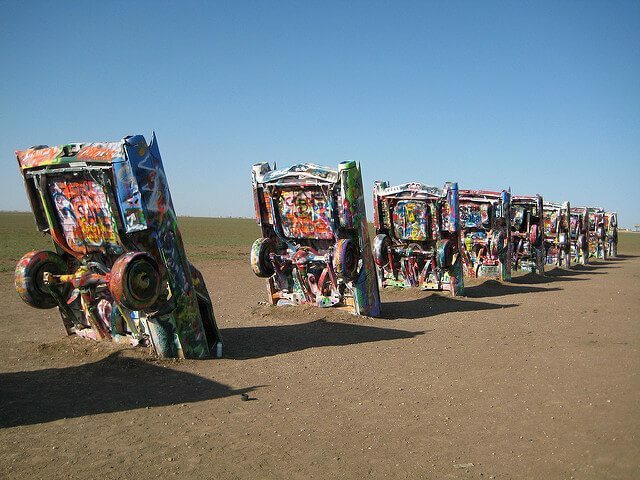 Artist Jim Reinders made yet another of America’s rendition of classic Stonehenge, this time with 39 used cars, painted gray. 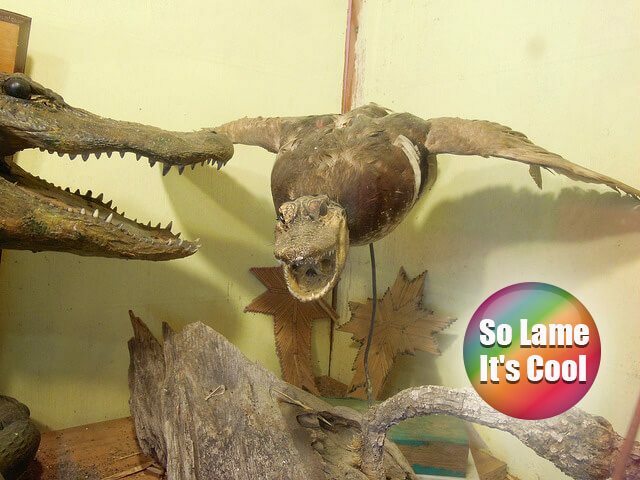 Metal artists and tinkerer Mel Gould’s place is a collection of wild and weird sculptures. 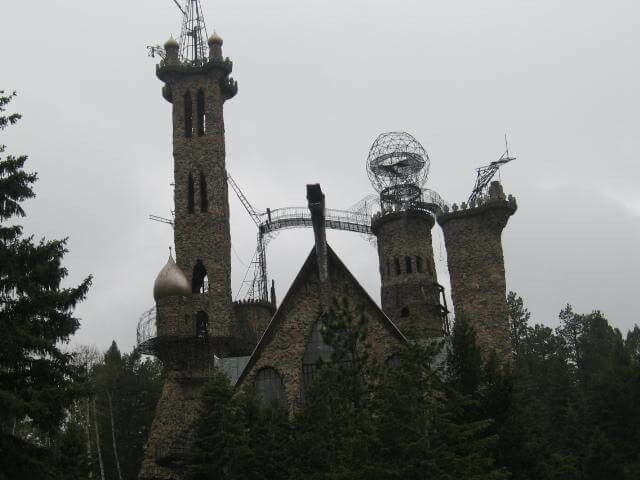 A one-man, 40-year project that began when Jim Bishop dropped out of high school, the “castle” is made on a mountainside out of more than 1,000 tons of rock in the middle of nowhere. 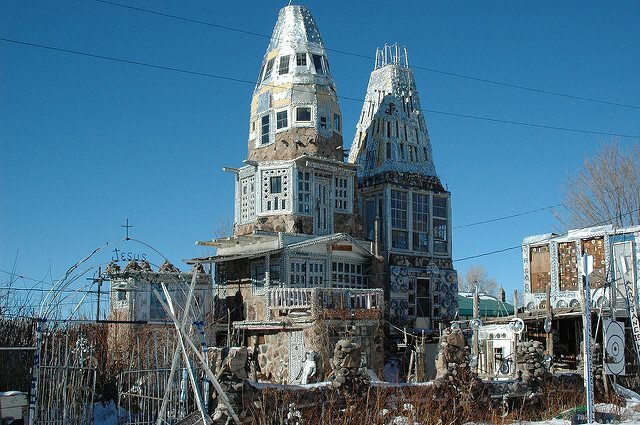 The ultimate find in beer can folk art, this self-built castle is comprised of four glittering towers made of smashed beer cans and hubcaps. 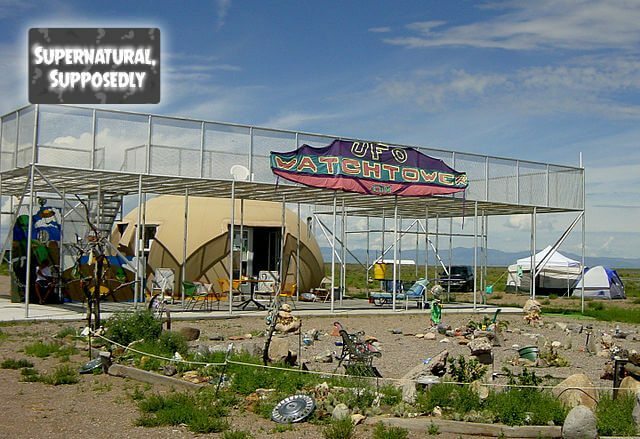 Say hello to interstellar neighbors while at this peaceful campground in the beautiful San Luis Valley. 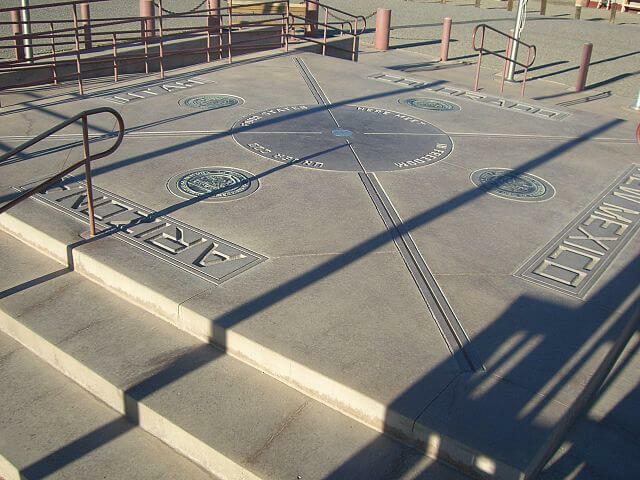 Hundreds of billboards draw visitors to “the geographical center of nowhere,” which boasts a cowboy orchestra, dinosaur, and jackalope. An actually usable, multipurpose facility decorated with crop art made from corn and grains, the Mitchell Corn Place is redecorated with new corn murals every year. 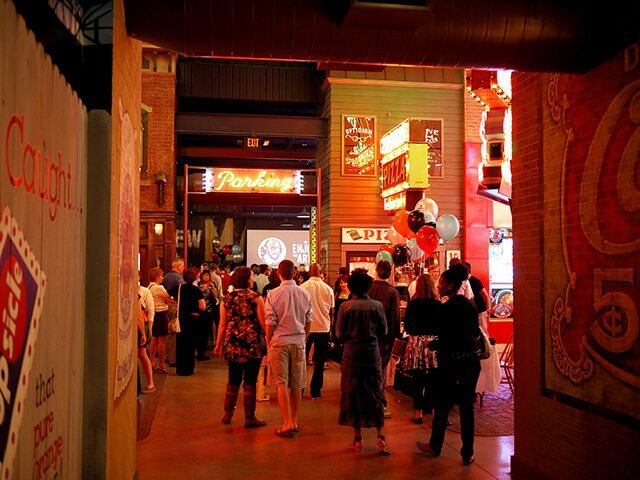 It hosts rock concerts, shows, and even a polka festival. 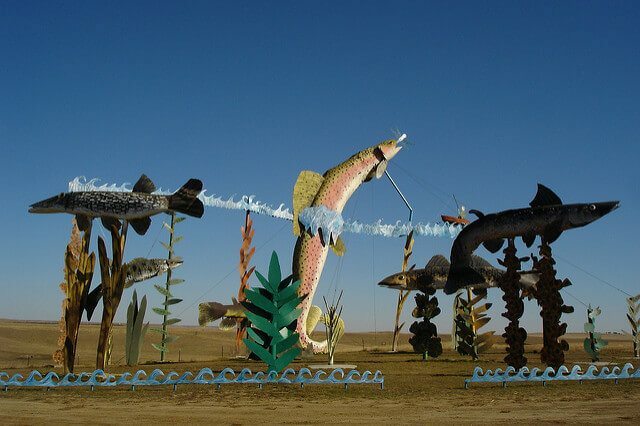 This is a really, really boring highway to drive down, but the long prairie in North Dakota is sometimes interrupted by huge, reality-skewing sculptures that can make your drive more magical. 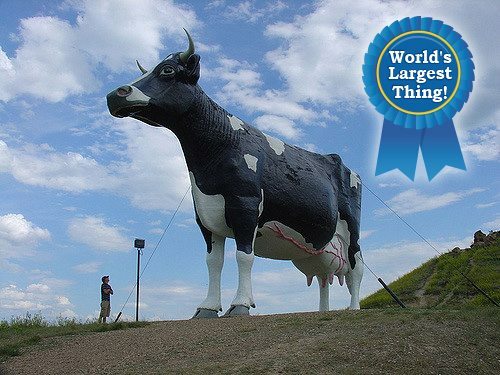 It’s a big cow (the world’s largest fiberglass cow, in fact). It’s a big, dead steer. 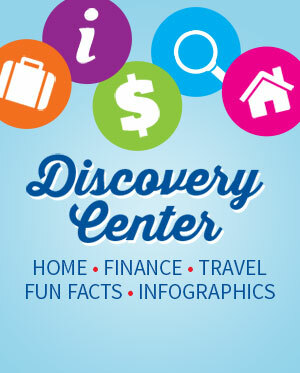 It was the world’s largest until Old Ben in Kokomo, Indiana, grew to be bigger. 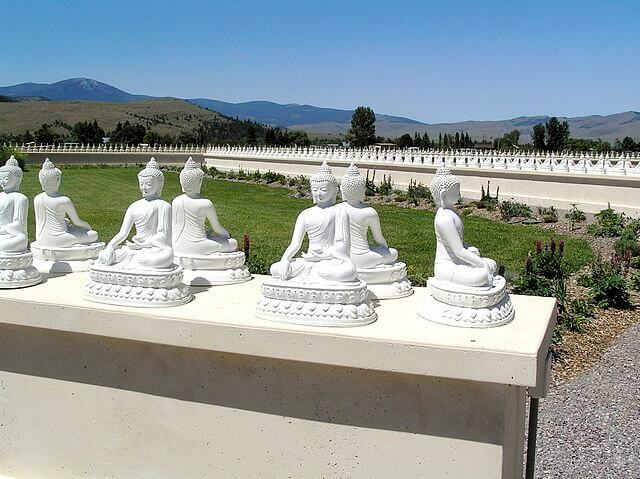 It doesn’t get more peaceful than a gorgeous garden in the middle of the Montana wilderness. Home to many retreats and festivals, it’s a pilgrimage destination for the Western Hemisphere. How much more boring can you get than the starchy potato? 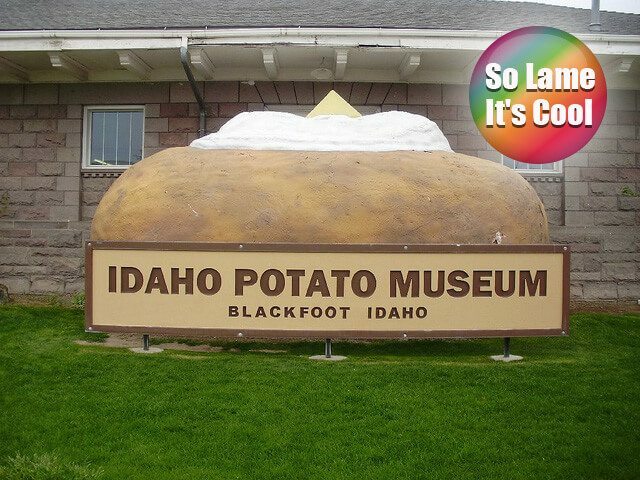 And yet, this little museum in Idaho manages to make it interesting. 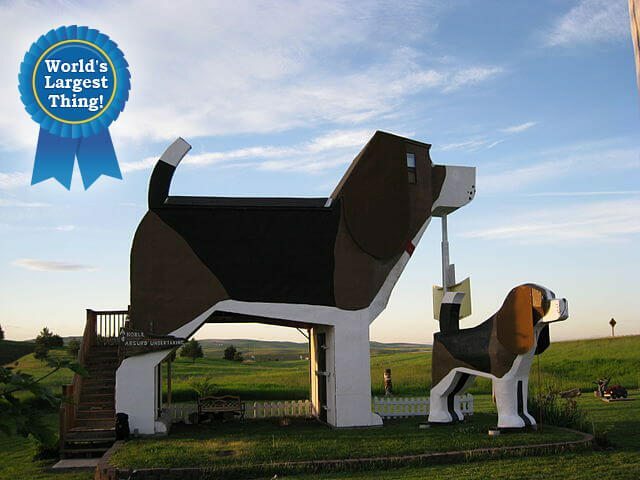 Have you ever hoped to sleep inside a dog-themed inn? When you’re roaming Idaho, you’ll have your chance. 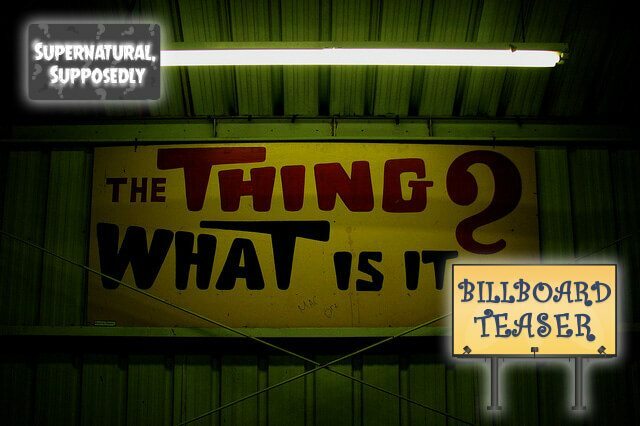 The summation of America’s art of grabbing the attention of passers-by pulled together all in one place, this museum is especially fun for those who love weird roadside attractions. These master neon-workers have done a great job keeping up these classic signs (and pay somewhere around $45,000 per year in electricity bills). After accidentally dropping a baseball in paint in high school, Michael Carmichael painted a baseball with numerous layers of colored paint every day for 34 years. Mad, you say? 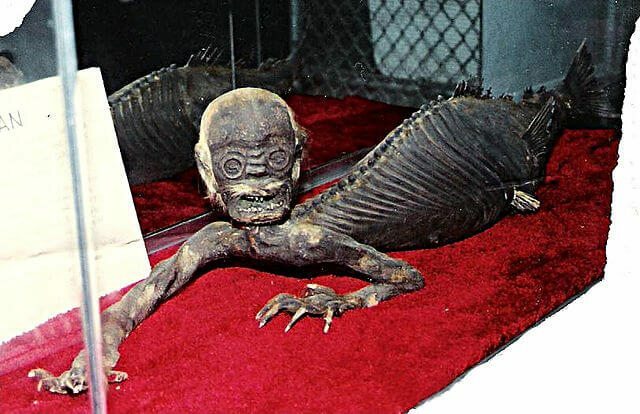 Well, now, this more-than-a-ton oddity draws crowds from all over the world. 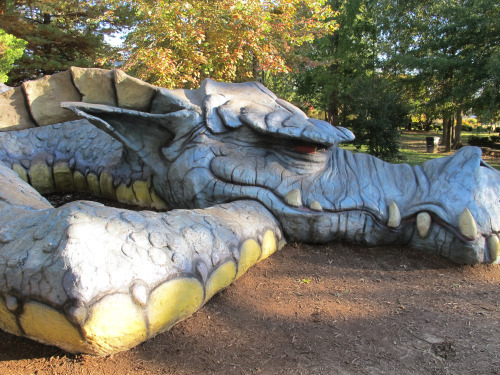 A teenaged boy passed away in a car accident, and his father, who knew that he loved playing Dungeons and Dragons, coordinated donations to build and maintain this memorial park in his honor, complete with dragons, wizards, and a castle playground. Perhaps you’ll learn how to animate dolls while barely moving your lips. Or perhaps you’ll enjoy some nightmares. 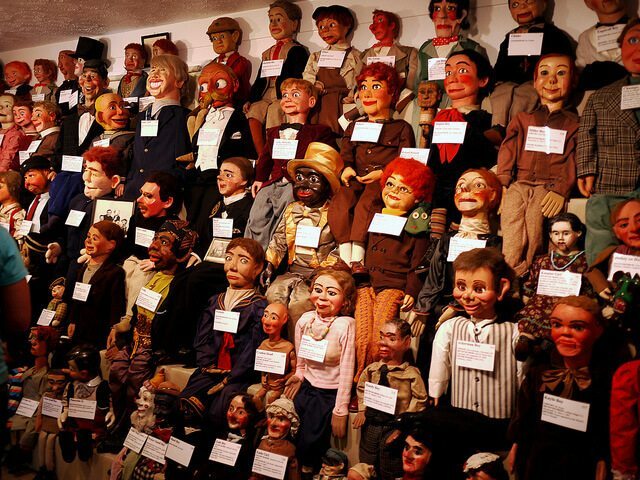 Either way, this stop is the home of more than 800 dummies and the only museum of its kind in the world. 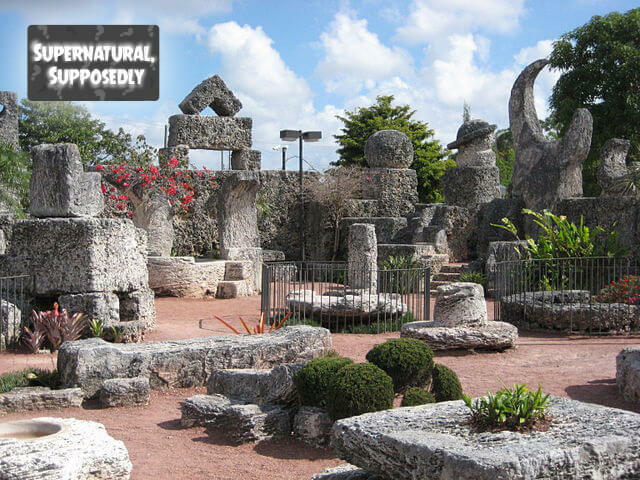 We’d like to say “Wow, Nature!” but this is actually a man-made mine. 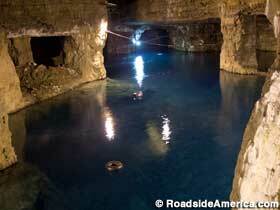 It’s one of the earliest deep-earth lead mines and now serves as a cool cavern for diving and riding along on a raft. No, really. You read that right. 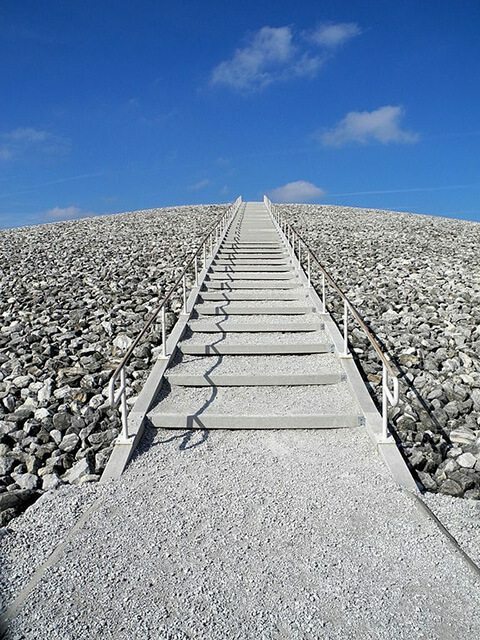 If you’re hoping to get superpowers from a waste dump, this mound hides 1.48 million cubic yards of unsavory materials. 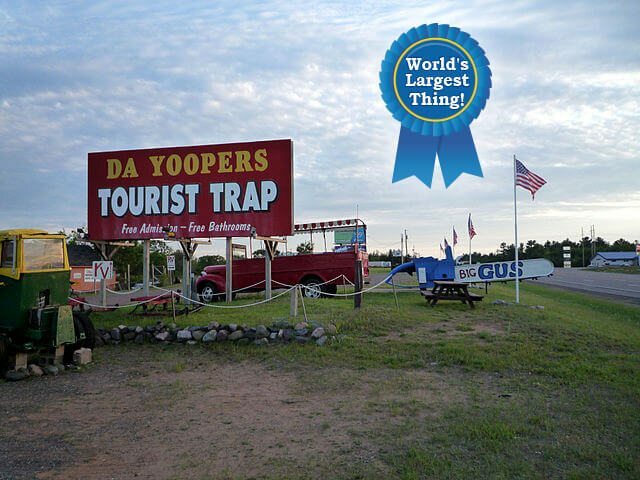 Hey, they called themselves a tourist trap! 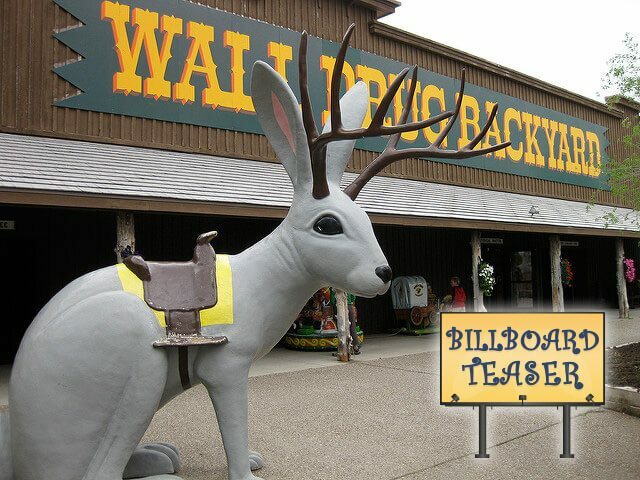 This place has the world’s largest working chainsaw (called Big Ernie), the world’s largest working rifle, a collection of folk art, live entertainment, and a celebration of all things hick. If you happen to be traveling through the run-down part of Detroit, you may see a huge art project made out of an old suburban landscape. It goes to show that Americans can make the best out of any situation. This familiar American mascot looks so happy to be providing healthy vegetables at 55 feet high! A vast collection of fossils, shells, minerals, and semi-precious stones make up this depiction of the life of Jesus, making this priest’s project worth somewhere around an estimated $4 million. Another homage to big, goofy signs, this collection of huge roadside fiberglass statues is another stop for those who stop. 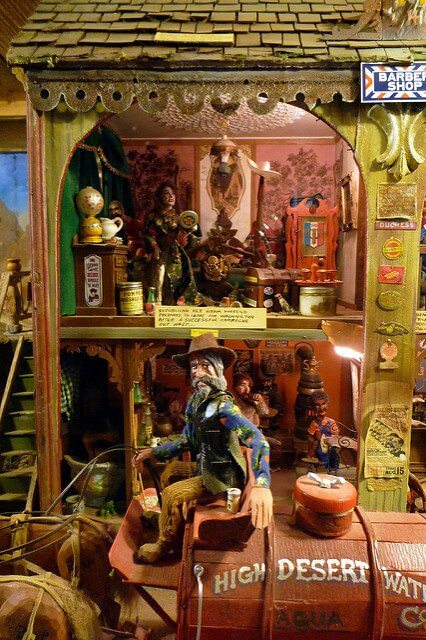 Teako Nunn, the enthusiastic collector, has gathered a huge array of fun, thrown-out statues, from a giant robot to a 30-foot-tall Uncle Sam, to surround his restaurant, Sparky’s Burgers. 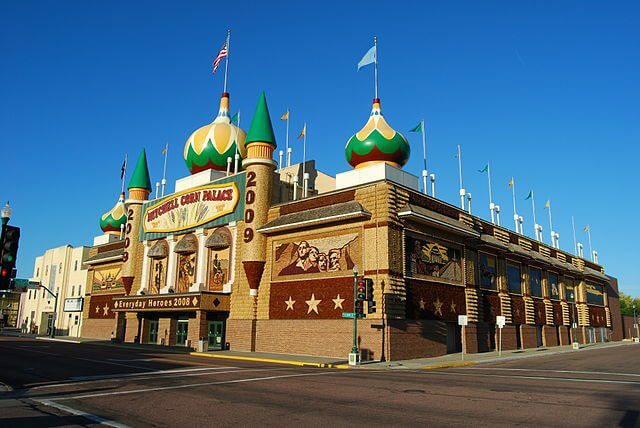 Along the Turquoise Trail lies a massive museum of fair and carnival collections, including 50,000 glass bottles, in a unique mix of folk art and nostalgia. States aren’t perfectly square, and nowhere else do the borders come together to form a perfectly perpendicular cross except right here. This is among the best roadside attractions in America when it comes to teasing information with billboards, with more than 200 signs asking tantalizing questions like, “What Is The Thing?” After driving for miles along the seemingly endless desert landscape with nothing to really look at but the funny billboards, even the most stubborn drivers will be tempted to stop and inspect “The Thing,” too. 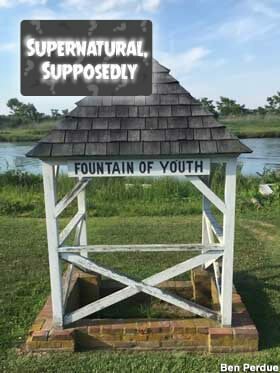 No, it’s not a replica! 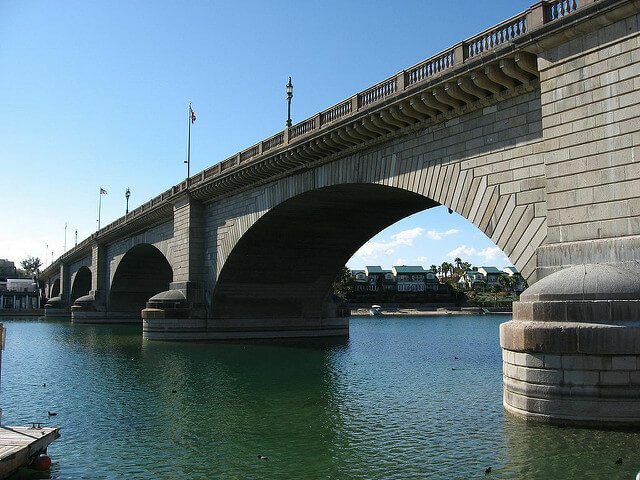 When you used to sing “London Bridge is falling down,” this was the actual, real bridge you were talking about. 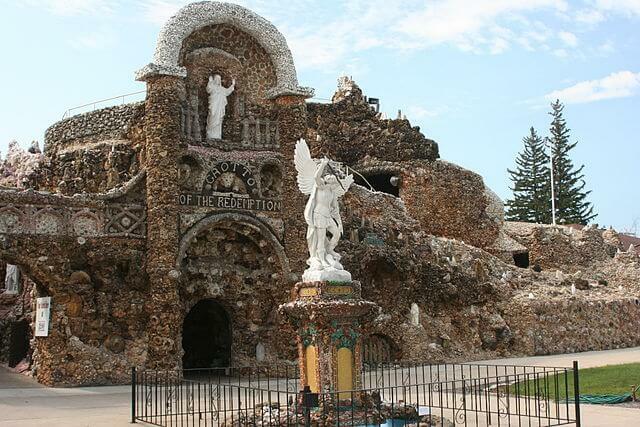 It was purchased and brought to Lake Havasu by an enthusiastic millionaire for about $2 million. Tour 14 rooms of a 5,000-square-foot home within the rock, check out the weird taxidermy and folk art, or pet the animals of the small zoo. 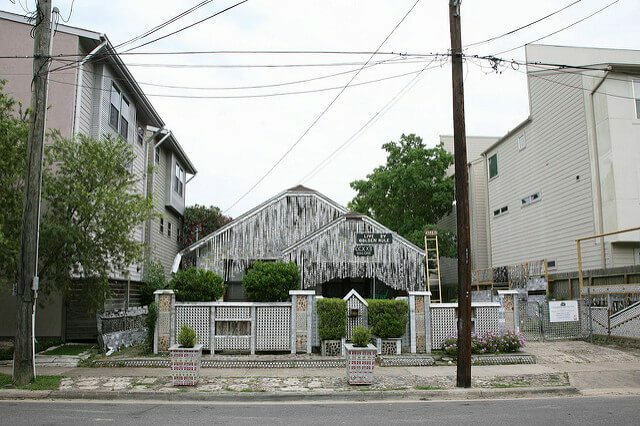 Tucked into a fairly suburban sprawl is a folk-art masterpiece: a house covered in beer can parts and art. 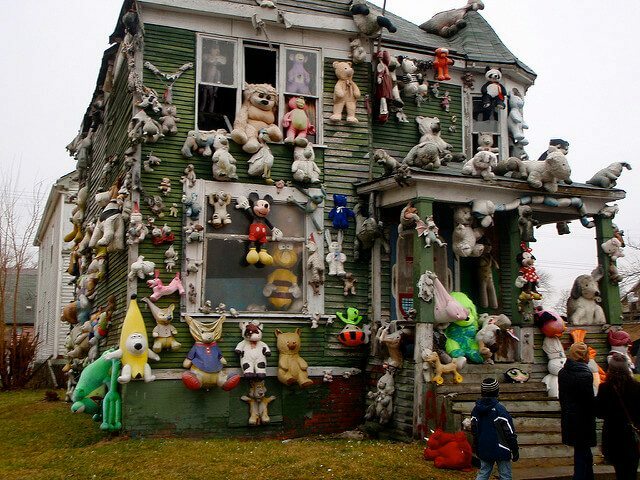 Created by John Milkovisch, a retired upholsterer, the house is a fun drive-by. For more than 40 years, this line of colorful Cadillac cars has decorated the side of Interstate 40. Created in 1974 by artists from San Francisco, the originally plain vehicles were progressively defaced with graffiti, which was eventually encouraged, making them even more beautiful. 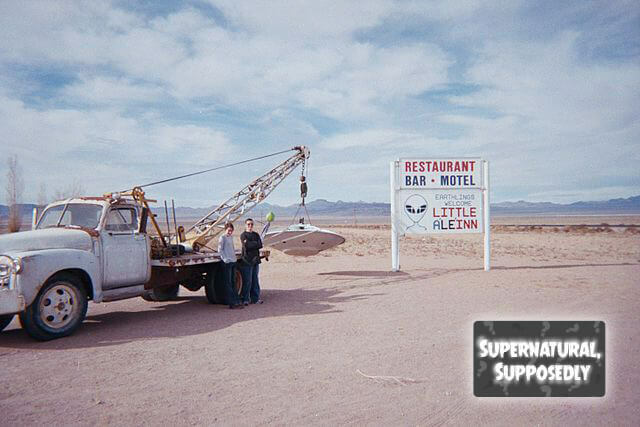 Earthlings can stop along the world-famous Extraterrestrial Highway and take a break from alien-hunting to enjoy an “alien burger” or shop for fun alien merchandise. 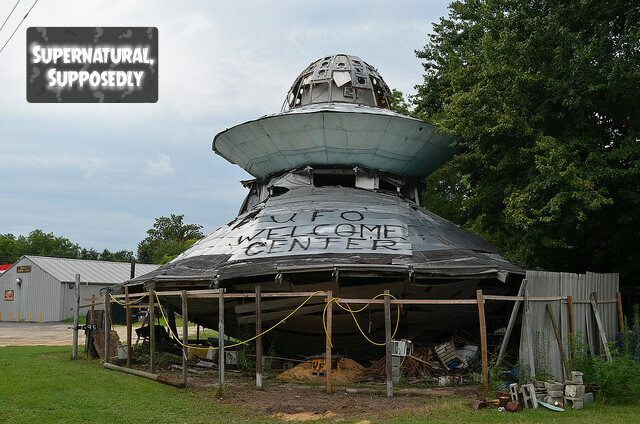 It’s a mecca for UFO tourism. 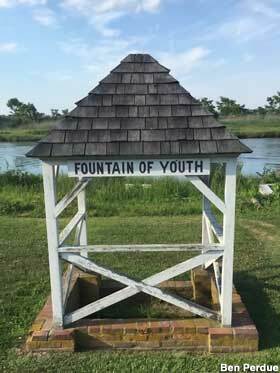 From far away, at first glance, you may mistake these artful sculptures for the real wild stallions that once roamed freely in this part of the state. 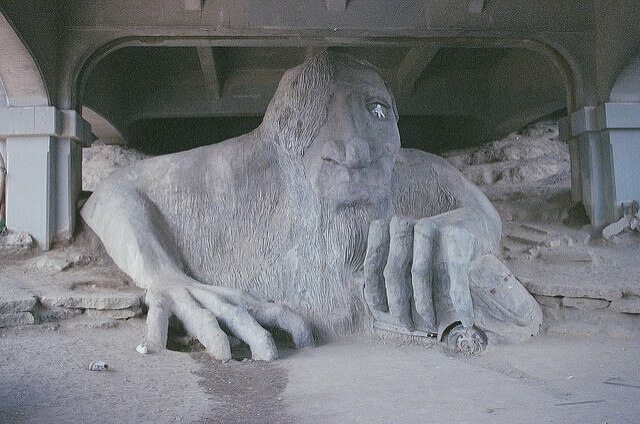 The Fremont neighborhood in Seattle is a pretty weird place, and in this self-proclaimed “center of the universe” lives a car-snatching troll under a bridge. Don’t worry, though; locals love his friendly, ugly face. 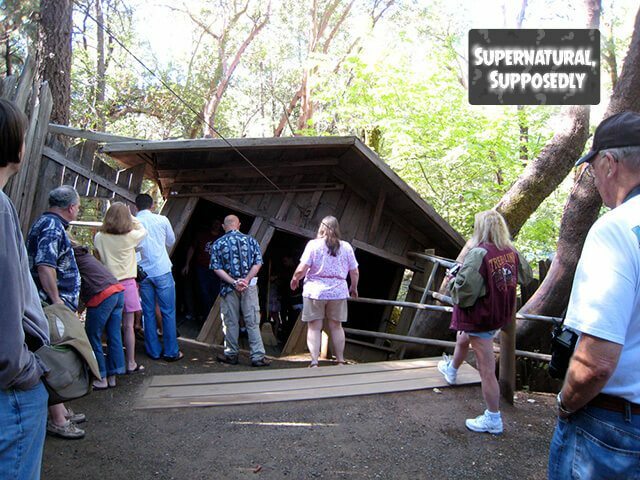 Gravity may begin to behave strangely when you visit the Oregon Vortex and House of Mystery. 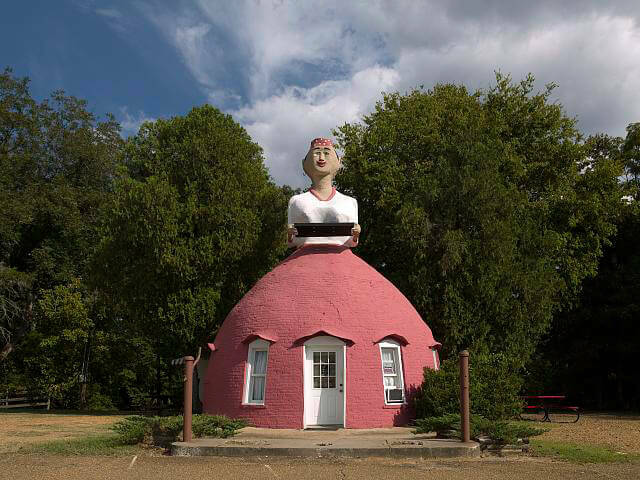 Like the Mystery Hole, this is one of America’s strange roadside attractions that mess with your mind with optical illusions. 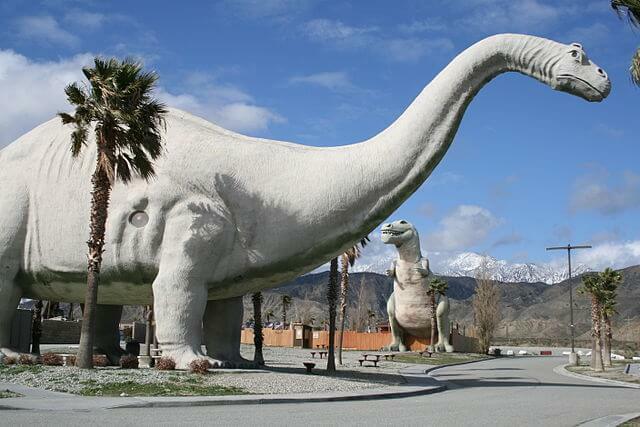 Several movies, such as The Wizard, National Lampoon’s Vacation, and Pee Wee’s Big Adventure, have found themselves here, but the cement dinosaurs are a great treat for kids today, too. For more than 40 years, this line of colorful Cadillac cars has decorated the side of A folk art creation in the middle of the Colorado Desert, this inspirational work made from adobe, straw, and paint inspires explorers the world over. 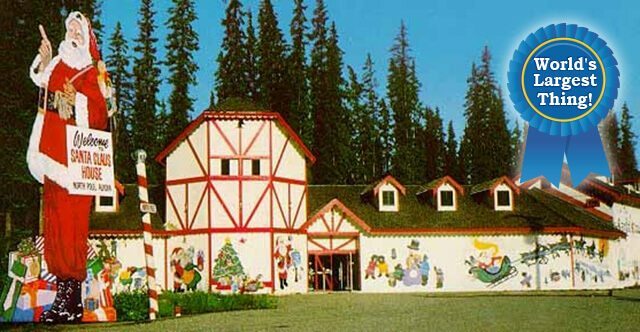 The North Pole is a real place, and Santa’s house is there. Enjoy Christmas any time of the year! 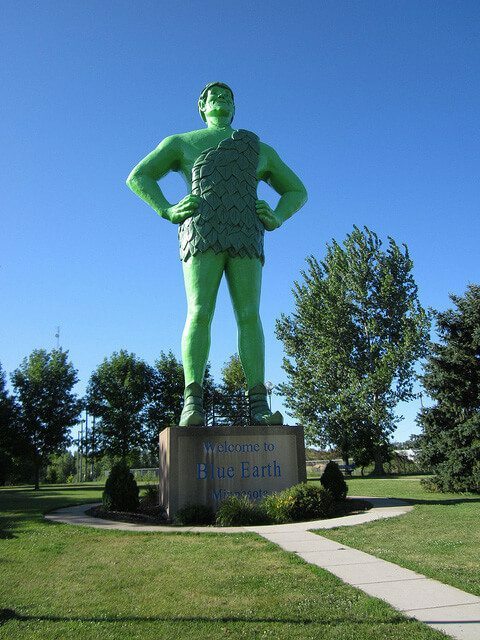 It’s also home to the world’s largest Santa Claus statue. 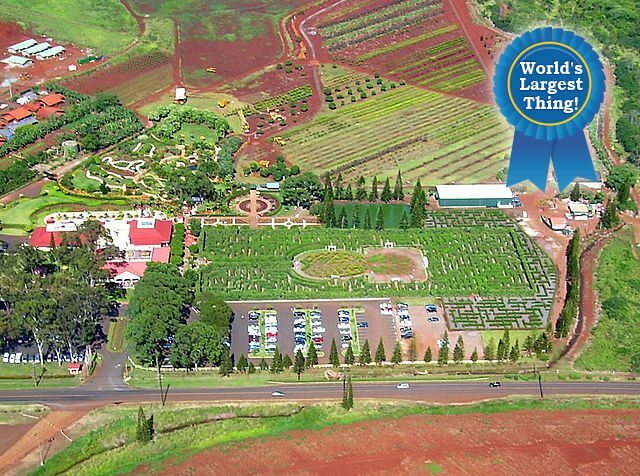 Fourteen thousand colorful Hawaiian plants cover the huge labyrinth on the Dole Plantation. The fastest finishers can win a prize and record their names in the history books!